Libya’s interior minister and nine of his family members flew into Cairo Monday on their private plane in what appeared to be the highest level defection from Gadhafi’s regime in months. Egyptian airport officials said Nassr al-Mabrouk Abdullah entered on a tourist visa. No Libyan embassy officials greeted him at the airport and one embassy official said they were not aware of his plans to visit Egypt. All officials spoke on condition of anonymity because they weren’t authorized to speak to the media. The minister flew in from Tunisia, which borders Libya. 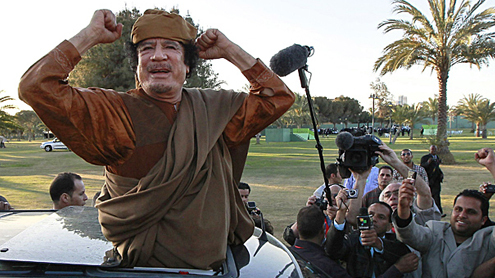 Canadian Foreign Affairs Minister John Baird said Monday that he thinks Gadhafi is finding himself “increasingly isolated in the entire world,” pointing to the minister’s apparent decision to defect. The Libyan leader’s message was broadcast early Monday and contained much of the same rhetoric used in previous addresses aimed to pump confidence in the fight against the rebels. He calls on Libyans to “dance, sing and fight” and says that as the number of “martyrs” increased, so does Libyan resolve. It is his first message since rebels in the western mountains launched an offensive toward Tripoli. On Sunday, the opposition fighters also battled government forces for control of the strategic city of Zawiya, just 48 kilometres from the capital, Tripoli.